Firstly, thank you all so much for the lovely comments regarding the Burda WoF skirt suit I posted in the last entry. I'm thrilled that so many of you left comments. I went away last weekend (being a holiday weekend) so no sewing got done and I haven't quite finished the dress I'm working on this week, but here's one from the vault. That said, sometimes a pattern comes along that I like enough to warrant it’s remake. This now OOP Butterick 3076, released in 2001, is such a simple and sweet dress that was so easy to make, I made it four times with rather different results. First, up I made it in a soft cotton in a pale yellow with a floral design. I made this over four years ago, and I still drag it out each summer and wear it at least once or twice. This version is rather plain, and it may encounter a run in with some trims soon to jazz it up. Here is a location shot (not my front yard for a change) – taken at a park not far from my house, worn with the only white shoes I own (and in fact this dress is the only thing I wear them with). The dress isn't as pale as it seems in the photo below, it's just that it was a very sunny day! Secondly, I made it in a polished cotton in a very Julia Roberts a la Pretty Woman brown polka dot print. I even wore it to the horse races with a hat recently! Made from the exact same pattern, but the different fabric gives it a totally different look. Actually this is the same fabric I made the red polka dot jacket from that I posted a while back (only this dress didn't stay a UFO like the jacket did). Thirdly, I made this into a formal dress to wear to a black tie affair for my husband’s work late last year. I used a black cotton lace over a cream soft polyester charmeuse style fabric, brightened up with a red grosgrain ribbon tied at the waist to match my red shoes (of course!). It turned out to be a very heavy dress, with the two layers of fabric and a voluminous skirt, but it looked so different from all the other dresses worn that night so I was very happy with it. And the fourth version of this dress was actually a UFO that I started in 2005, meaning to wear to a friend’s wedding which was held the week after mine. But with the chaos of finishing my own wedding dress and bridesmaid’s dresses, plus a severe change in weather from really hot at my wedding to rather cold a week later I didn’t finish it and wore something else. But when my brother in law married last December on the beach in lovely Noosa I thought this would be ideal so I had reason to finish it. It’s made from a pale pink cotton, with stripes and a cherry blossom print. I used thin black grosgrain ribbon as trim to highlight the waist and cross over back. I even bought a funky pink and black hat to wear with it since it was going to be outside and I get sun burnt in a few milliseconds, but it turned out to be a rather windy day so I gave it a miss. When we were walking to the beach for the ceremony, we passed a fancy dress shop on the main street and one of the sales assistants gave me a smile and a nod, so I felt pretty special in it! As I mentioned in a previous post, the jacket is 115A in the 12/07 magazine, which is shown in the magazine made in a bright fire engine red, but I chose a far more subtle charcoal wool flannel, with white topstitching to emphasise the seam lines. I made a size 38 which fits very well, despite the jacket sticking out there under my arm due to my awkward pose (this photo was taken at 7am in the morning on the way to work, hence the grimace!). The skirt is View B from Simplicity 5914 (the one in the photo), which has a marvellous swishing action around my knees when I walk! It is made up of three panels across the front and three panels across the back made identically, so to achieve a better fit across my rear I tapered in the top half of the gores in lieu of darts because my rear is not as flat as my front. The only other changes I made were to include a lining, and to use an invisible zip. To match the lines of the jacket I topstitched the seam lines with white cotton and whilst the vertical seams of the skirt and jacket do not really line up I think it is a rather good effect. Christina asked in the comments to my last post what I would wear underneath the jacket. Well here I have worn it with a scoop neck RTW top which has reached the end of it's life 'cos it's a bit stretched out (as you can see in the first post) but I love the colour so I gave it one last wear. But it's a good question because with the shawl collar and wide opening to the jacket I don't think a collared shirt would work, but maybe a boat neck top or just a round neck top would be fine. Or if I'm feeling particularly over the top, possible a blouse with a bow around the neck! And to everyone else who left such lovely comments on the previous post - thank you so much! wowser, my blog stats have gone through the roof thanks to Erin over at Dress A Day giving me a shout out on her blog about the post I did on using the Ikea drawers for pattern storage. I thought she would be interested given she must have a vast collection, but it turns out lots of people are interested too! So thank you all for making the journey over here and leaving lovely comments on various posts. I'll try to address some of the comments now. barbie2be, yes I know the amount of sewing patterns I have (nearly 600 now) is a shameful over consumption, but I can justify: I get most of the patterns from op shops (I am recycling and they are cheap), I use / plan to use a lot of them (so they are useful and not just hoarded junk), lots of people give me patterns when a relative passes away and they're happy to see them go to a good home (I'm doing a community service) but mostly because I love looking at the pictures and find them as inspirational as any fashion magazine. Also I think there is some little known law of physics that says an item will expand in volume to fill it's available space of containment, so who am I to deny the forces of nature and not buy any more patterns? Good thing I don't work in a fabric shop like Jean C and her daughter did - imagine getting free patterns on a regular basis! Sorry Jean no photos of my closets because they are packed and a little messy. I have three of them - one for summer clothes, one for winter clothes and one for special occasion and little used clothes. Not just me though, my husband has his in there too. I don't know what I'm going to do when I have kids and they need cupboard space of their own! And to all those that admired the Ikea solution for pattern storage, I'm glad the Ikea solution may help you out with your pattern storage too, and that it brought you here to my little blog! What's with Burda WoF instructions? 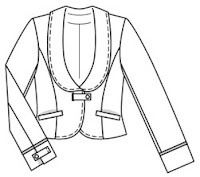 I am still perserving with the Burda World of Fashion 12/2008 jacket 115A, but it is seriously trying my patience! The instructions are very scant indeed, and the pattern photo makes it very hard to get an understanding of what it's supposed to look like. The pattern instructions give one paragraph and but no photos or diagrams for a bound pocket! I'll get there though I may deviate from the lacklustre instructions. This morning the husband and I headed to a Sydney beach side suburb to see our optometrist but I took the opportunity to get some photos of some clothes I have made previously. It wasn't overly warm or sunny down there at the beach, but there were still some foolhardy people out there swimming. This jacket is actually a muslin I made last year as a precursor to the beige wool skirt suit I posted about here. I made no changes to the pattern (Simplicity 3874) on this version, although for the wool version I made a few changes such as pleating around the yoke band instead of gathering, lining the jacket and using a button (which I still may do to this version). This one is made from a vintage barkcloth curtain picked up in an opshop of course! The cotton of the jacket gets very crinkly, but it's meant to be a casual lightweight jacket so I can live with that. 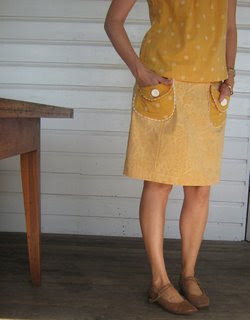 I made the skirt from some caramel coloured stretch corduroy about two years ago. It's an a-line shape, with an inverted box pleat at the front and it's very comfy to wear although I should have lined it since I usually only wear it in winter with stockings. Anyway the weather is being very conducive to sewing - having heavy downpours of rain for most of the day means it's excellent to stay inside. I hope to finish that Burda jacket and a matching skirt by Sunday, fingers crossed. I love those large envelope Vogues, particularly that Bill Blass dress there in the centre which I think will make it soon on the to do list. I also found this really cute tea towel that I'll make into a tote bag, and this huge roll of waistband petersham for the pricely sum of $1! I also found these four lovely ties for 50c each, which if a colleague of mine doesn't want them I will make them into wrist cuffs, little pouches or even a wallet as I've seen on some of the handy tutorials over at Craftster. And the guilty buys alluded to in the title? Well I picked up the latest Burda World of Fashion (2/2008) which at $15 is expensive, but is a total bargain given that it has about 40 or 50 patterns in it. However, it is not a bargain if I never use the patterns, and since I have about 7 magazines now and have used one pattern that equates to $105 for the one skirt I made (which I didn't even like that much)! Realising this, I have now vowed to make at least one thing from each magazine, starting with jacket 115A from the 12/2007 edition which I traced out on Wednesday night. These don't include my joggers or boots, but my husband's shoes do take up the bottom row and and half of the second bottom row, so I think his might be shuffling off elsewhere soon. Anyway, I'm on a flexi today (that's government employee speak for having a day off using accrued extra time), so I'm getting started on that Burda jacket. p.s Ruby Darling who commented on my post "Hey you that's my fabric", the red shoes are from Sachi but from about three years ago, and they are in fact the shoes I wore on my wedding day. what a weekend - 3 handmade gifts and another UFO done! Well I had a very productive weekend starting and finishing three handsewn gifts for friends, and finishing off a UFO to boot! All this on top of the usual fun and frivolity of housework and washing and going out on Sunday afternoon. I made it from a lovely soft cotton jersey in a charcoal grey colour with red bias binding trim. I thought this was a gender neutral colour choice, but looking at the finished outfit I think it looks a like a little ninja outfit! It was so simple to make, and the whole outfit took half a day because there are no facings and the sleeves go in flat. A few of the techniques used are different from big people's clothes, such as finishing the hems before sewing the side seams, but I guess this is because it's very hard to get your hands in those small arms and legs to sew in the round! It's made from some pink and white stripe cotton, with white cotton flannel backing and pink lingerie elastic, using the free Marcel template over at Burda Style. The text is just printed on t-shirt transfer paper using a vintage font from the fontdiner. My friend thought it was hilariously funny, so the joke hit the mark! And because I didn't want my third friend to feel left out, I made her a pair of slippers again from the free Alice pattern also over at Burda Style, from some scraps of lovely soft grey wool flannel with layers of wool melton fabric sandwiched in between for softness. And for durability I used the rubber soles from freebie disposable slippers I picked up at a classy hotel last time I stayed in one. Put on some buttons for decoration and I think they're pretty cute. And so did my friend. I orginially wanted this jacket to be a soft and lightweight summer jacket, as the red polka dot fabric is a light brushed cotton, so I lined it with cotton poplin and didn't use much interfacing. But of course that didn't work, because linings need to be slippery to slide over the clothes worn underneath. So I ripped it apart and it became a UFO. But since I love the fabric I decided to finally finish it by interfacing the collar, neck and front facings, sleeve and jacket hems, and lining it with some polyester lining. But I couldn't remember what pattern I used to make this, and I had somehow lost all the facings, so I just made an exact copy of the outer jacket and had the lining go right to the edge. I also used the cotton poplin back lining piece as an underlining to give the body a bit more structure. And because I knew the lining would show as there are no facings, I used a funky eggplant purple colour lining picked up in the recent Remnant Warehouse sale for $1/m. I haven't put any buttons on it yet 'cos I haven't found any quite right, but I think it's now moved from the UFO category to wearable WIP category (yeah, that exists for me sadly). Photo credits go to my husband - yes I am standing in the middle of the street but that's so me and the Sydney Harbour bridge can be in the photo, but since this was taken down in the Rocks (a heritage precinct in Sydney) there were brides galore getting their photos taken in random places for that gritty, urban and unexpected kind of scene. 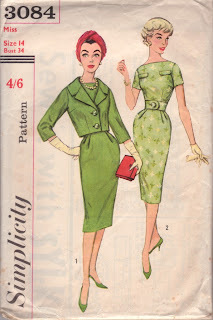 One of the things I love about vintage patterns is the poses used in illustrations of the models on the envelope: they have such poise, elegance and tiny, tiny waists (well they usually are drawings and not real life models after all). So of course when we real life bodies make these dresses, the outcome is not exactly the same…. With this dress, made from a 1959 Simplicity pattern, I have to stand up straight because if I slouch those pleats at the waist puff out and give me an unflattering beer belly where one does not exist! Sewing up the dress should have been easy since it has rather simple lines, but it was made harder by the pattern pieces being those ones where the patterns marking are perforated instead of printed (those dots are ruining my eyesight!) and picking a fabric that required a lot of match at the seams and zipper. However once past those challenges it came together rather easy. The only alterations I made were to use an invisible zipper at the centre back seam instead of a lapped zipper and to underline the dress with a bright orange cotton batiste - I’m guessing that vintage dress patterns don’t usually call for linings because the ladies of the day wore full slips but I don’t profess to be a lady so I definitely needed a lining! I also left off the pocket because the print of the dress was busy enough so their effect was limited. I made this dress from a crisp cotton purchased from Lincraft when they had their 50% off summer fabrics sale a few weeks ago. It is a rather bold and busy pattern for a dress, but I don't like being boring so I thought why not? I did make the matching belt, with a big brown button, but it didn't stand out because the print is so busy, so I've worn here instead with a plain brown belt, to match some old brown Witchery t-bar heels I nearly through out just a few weeks ago. I also made the jacket, from a textured cotton canvas and large plastic buttons I had in the stash. I’m loving the gloriously wide lapel and bracelet length sleeves, and look how good my notched collars turned out! Normally I do an atrocious job on those notched collars and have to hand stitch and steam the hell out of them to get them into line, but I followed this tutorial by Barbara Weiland that appeared in the November 2002 edition of Sew News magazine and it just worked this time. Unfortunately the weather here in Sydney has finally turned cool so I may not wear this dress and jacket anytime soon, although maybe with black opaque stockings and a warmer jacket I could make it work – it is in autumn colours after all. Since I'm a relative newbie to the world of blogging, I haven't as yet figured out how to email the lovely individuals who leave comments on my posts. So as a catchall action I'd like to thank all of you for reading my ramblings and taking the time to comment. I am hugely guilty of lurking on blogs but now that I know the giddy pleasure derived from comments (or is that just me?) I am endeavouring to have my 2 cents worth when I see something amazing. When I started this blog it was mainly to keep my real life friends (and my mum) whom I don't see every day up to date with my latest creations, so I wasn't too fussed how many people looked and commented. But it's very exciting to receive comments from very talented sewers whose blogs I have been reading and loving for ages, as well as discovering new blogs to add to my extensive list of favourites. Carolyn of the legendary diaryofasewingfanatic who commented on my post about seeing your fabric on someone else, I’m sure the woman wearing the Ann Taylor skirt wasn’t amused because you are a ‘plus size chick’ wearing it, I think she was jealous that a) she paid too much, b) yours would have been much better made, and c) I bet you were totally rocking it too. Shannon of the awesome Hungry Zombie Couture - it’s too funny that you say you have been lurking for a bit on my blog, because I’ve been a massive lurker on your blog! Antoinette of the diversely creative clevergirl.org - I think it’s our duty as sewers to rescue patterns from the recycling pulp mills of the world, and a total count of your patterns can only be a badge of honour…. Lsaspacey of lifeisexamined - thank you for the lovely comment about my wedding dress – every bride loves to hear they looked beautiful on their wedding day. To the very funny Livebird, I am not nearly as close to my wardrobe being entirely handmade as Carolyn is, but I’d say I’m about 60% there, always increasing of course! Colette of the very addictive Sew Tessuti – I will try and think of a project worthy enough for the Tessuti awards, more reason to come and buy more fabric I think! Melissa of Fehr Trade – I love seeing pictures of your houseboat, so I can’t wait to see your revamped sewing room. And to the stylish Reethi (of weekend crafting) I stole this idea from your blog, hope you don’t mind! And then, just to make sure I couldn't ignore him, he stared at me like this for a good 10 minutes! Hey, you, that's MY fabric! Another of the reasons that I sew (aside from not having to buy outrageously priced clothes that never fit) is that I like being able to wear clothes that are unique and different from everyone else. It is unlikely that you would ever see someone else wearing your exact same creation because of the millions of patterns out there, individual adjustments to the patterns plus the wide variety of fabric available to make into clothes. Given that I do buy a fair bit of fabric from large chain stores such as Spotlight and Lincraft it is possible that I would see someone else wearing something made from the same fabric. But it is still surprising to see it, and it hasn’t happened before until just recently when I had two encounters. First up I spotted a lady wearing a shirt from this same cotton that I purchased from Spotlight that I had made into a skirt using a now OOP Butterick 5172. My husband and I were walking through Chinatown heading for yum cha at the Marigold (the best yum cha spot in Sydney) when I spotted her walking ahead in the same direction. I wanted to go and say something to her, but my husband thought she might be freaked out by that so I didn’t…. Shortly after this photo was taken a few weeks ago this skirt met it’s demise and is now in the great rag bag in the sky (or rather my laundry). It’s a sordid tale of a close encounter in the washing machine with a new piece of red fabric which left it’s tell tale pinkish hue all over the skirt. Sadly a soak in a bucket with colour run remover drained all the life and colour out of the print. Notes to self: (1) read the instructions on packets and (2) colour run remover works exceedingly well but is best used for whites……..
And that is just too funny, but since I do use curtains and sheets (usually vintage) to make clothes it’s only natural that someone do the reverse. I've been told that Tessuti means fabric in Italian, but it is also the name of a fabbo dress fabric shop here in Sydney, so the title of this post is true on both levels. They sell the most wonderful fabrics sourced from places such as Italy and France, and have a large and wonderful range. If you’re a Sydneysider get yourself there quick smart and expect to add to the fabric stash in a serious way, but if you’re from further afield all is not lost because they have also have a mail order service so check them out: http://www.tessuti.com.au/. Since the lovely Colette from Tessuti’s has left a few charming comments on my previous posts, I thought I would show my appreciation by showing something I have made from their fabric. One of the fabrics I bought from there about two years ago is a lovely and soft cotton, in a black and white floral print splashed with some red chrysanthemums. It sat in my stash for a while as I needed time to settle on a project worthy of its loveliness. I made a simple shift dress made from Simplicity 9404, which is actually designed for knit fabrics but had enough ease in the pattern to be worn as a fitted shift. I kept the lines of the dress rather simple because the fabric was so beautiful I wanted it to be the focus rather than the construction details. The dress is so comfortable, and the fabric wears so well that by the end of the day there's hardly any wrinkles at all. I do recommend you have a look at Colette’s blog, it has customers creations, her own amazing garments and new fabrics coming into the store. Truth be told however I’m too bashful to wear one of my creations from their fabric in the store because the standard of what everyone else comes up with is just outstanding!